Good and Bad Examples of Presentation. Andersons view on public speaking was similar to what we are all used to knowing, he just explained it in a way that was different from what people tend to see it as. But at the end, there are similarities between the way people usually sees it to the way he sees it. – Something that really caught my attention from the video is that there is no established formula to give a good speech. There is no proper way to give a speech because the point is to transmits one’s idea to others people’s mind, make them see what you see. -Ideas are what make our world our world. “Our world” is composed of many different ideas, but in the long run those ideas are all connected to each other. These ideas give us our own perspective on what we believe in or in other words give the structure to our world. – I think two major keys , which was the use of language and to get on a even ground with the audience, from the four Chris Anderson presented are the most important. Language is important because you never really know the level of understanding your audience has. So you always have to understand your audience first. The second point which was get on an even ground with the audience is also important because how can you start implanting your idea in someone else’s mind if you don’t understand the audience. To achieve this it is always important to use metaphors to give the audience a better understanding of your idea. 3.) Some important things that I took from a good presentation is to be prepared with your presentation so you won’t have to deal with trying to remember things. Also to keep your audience engaged in what you are presenting, you have to keep your slides nice and short. Your slides need to have the least amount of words possible. For instance, instead of having paragraphs you should have bullet points that show your key ideas of that certain slide you are presenting. You should also have some picture in your slides. In bad presentations, it is basically the opposite of these things. To sum up the components to a bad presentation, showing no effort and interest to your presentation will make your presentation a bad presentation. 4.) The idea of speaking in public is a bit nerve racking. Even though I have a good amount of experience with public speaking, I still get a bit nervous when I go up in front of a crowd and express an opinion. 5.) 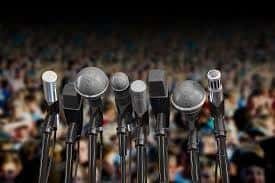 My prior experiences with public speaking have been primarily in school and church. In school i’ve gained experience because typically every school year we have to present at least a book report or something. I’ve had my main practice at church. I have given speeches at church and read excerpts of the Bible in front of the crowd. This has helped me prepare myself for public speaking, even though I feel like I need way more practice. Ted Talks by Adrian is licensed under a Creative Commons Attribution-ShareAlike 4.0 International License.